The Wahl Elite Pro Hair Kit is a 21 piece hair trimming/cutting kit designed to cut your hair or the hair of the entire family. Featuring a powerful motor and a reasonable length warranty this hair kit can save you a lot of money over the next few years. In this review, we will discuss all its features as well as pros and cons according to the users. The Wahl Elite Pro Hair Kit features 10 combs ½, 1, 1 1/2-3/16, 2, 3, 4, 5, 6, 7 and 8. With each ½ increment being 1/16 length. These different combs allows you to cut all different hair lengths. The Wahl Elite Pro Hair Kit has self sharpening blades which are easy to clean simply by brushing off the blade after each use. This hair clipper uses a durable and strong 8 foot cord. The cord is long enough to easily cut hair from all sides and angles. Smooth Round Tips on Comb: The combs that accompany this hair kit have gently rounded tips that makes hair cutting with this hair clipper more comfortable than with combs that come with a sharper tip. 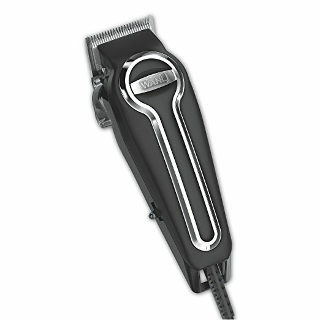 Strong Motor: This Wahl hair kit has a strong professional style motor that is designed to give you years of use. Combs are Sturdy and Stay in Place: Unlike many other hair clippers with weak combs that don’t always fit as they should, users find that these combs are extremely durable and that they stay in place throughout the entire hair trimming/cutting process. Clipper Has a nice weight: Users like that these hair clippers has a nice sturdy feel to it and carries a bit of weight. Long Lasting Blades: The blades on this clipper last for a long time with proper care resulting in a smoother cut than you get with many other clippers. The Wahl Elite Hair kit comes with a 5 year warranty, which results in the ability to save money on the cost of professional hair cuts. If you are looking for a great hair clipper kit to cut your own or your family’s hair than you may want to consider the Wahl Elite Pro Hair Kit.